After the debacle that was DIVAS Live last, it look like VH1 decided to regroup and actually bring some talent into the building. Although this lineup certainly does not match the lineups of yesteryear, it is definitely a lot more impressive than last year. I would have loved to seen a name like Gladys Knight, Chaka Khan or Rachelle Ferrell, but I'll take MJB and Jilly from Philly anyday. NEW YORK – October 27, 2011 – VH1’s beloved, popular franchise, VH1 Divas, returns and will pay tribute to the cities where soul gave birth to music’s most powerful classics and inspired today’s divas. Mary J. Blige, Jennifer Hudson, Jill Scott, Florence + The Machine, Kelly Clarkson and Jessie J will pay homage to these cities and soul music’s timeless classics at New York City’s Hammerstein Ballroom. 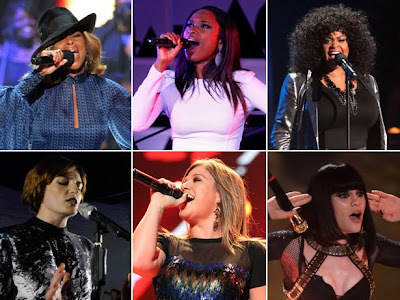 VH1 Divas Celebrates Soul premieres Monday, December 19 at 9 p.m. ET/8 CT on VH1. VH1 Divas Celebrates Soul will bring together some of the best singers across the globe, men and women alike, to honor the soulful cities that inspired these divas and their art. The cities honored include: Chicago, Detroit, London, Memphis and Philadelphia. Accompanied by one of the most exciting groups of modern soul, The Roots, with ?uestlove as musical director, each diva will pay tribute through not only their own soul-inspired songs, but some of the greatest classics that have shaped a genre. As in previous years, this edition of VH1 Divas will benefit VH1 Save The Music Foundation and its programs to restore music education in public schools. For more information, please visit vh1savethemusic.org. This year’s sponsors for VH1 Divas Celebrates Soul include: COVERGIRL, GEICO, Hershey®’s, Old Navy and The Wendy’s Company. Additional performers, presenters, special guests and sponsors will be announced as they are confirmed.